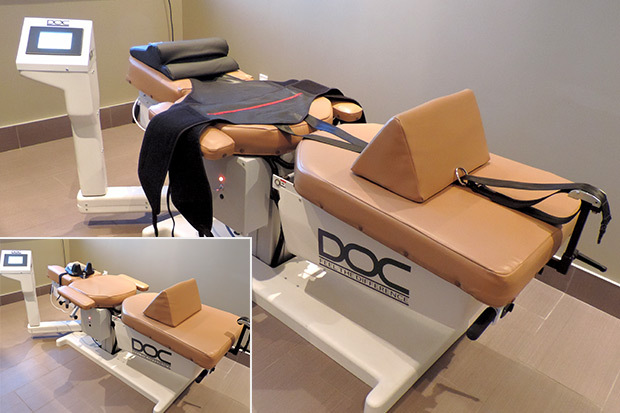 Spinal Decompression is primarily used to treat disc injuries in the neck and low back as well as degenerative disc disease, chronic low back, and sciatica. The highly advanced automated traction device unloads the vertebrae by gently separating them from each other. This pull causes a vacuum inside the discs and encourages herniated or bulging discs off the nerve root. This happens only microscopically each time, but after consistent regularly scheduled visits the results are quite dramatic. The cycles of decompression over a series of visits promote the diffusion of water, oxygen and nutrient rich fluids from the outside of the discs to the inside and enable the torn and degenerated disc fibers to heal. Spinal Decompression not only significantly reduces or eliminates back pain but also enables the majority of patients to return to their activities that they gave up due to back pain.